You’ll start the game on a globe and can pick one country at first: China. It’s free but you have to purchase the other countries with stories, as well as train packs, separately. In each country is a train track with stops. At each stop is an activity. You’ll either watch a movie, build a train track, or have a race. Completing each activity will unlock a new train or object for you to use when building tracks. Go around the track once to finish that country’s story, but you can still play the activities to unlock more things. There are two ways you can build tracks. Some require you to use a blueprint and match the right track or object to a spot on the grid. The drag and drop controls are easy to learn. Other times you can just free build whatever you want. When you are done, you can place a train on the tracks, and view the action from the train’s eye point of view, which is the best part of the game. Races aren’t quite as good. You just hold down a button to go, and sometimes you can push a turbo button for a burst of speed, and that’s it. The game has a few other minor problems, too. I wish that there was a separate option to do the free build tracks on the main menu, as that’s the best part of the game. At least it’s easy just to go to a country. Also, one of the places you visit is the fictional island of Sodor. For a game that is all about learning about other countries, having a fictional place in there seems to defeat the purpose. And last, since there is no reading skill required, everything has spoken voice. You can opt to turn off the voices, but then that makes the game kind of hard to play since there are no subtitles or anything. So you always have to have the volume on to play. But I imagine these problems could be fixed with updates. Speaking of which, the game hints at even more updates and new countries, so that might be promising. 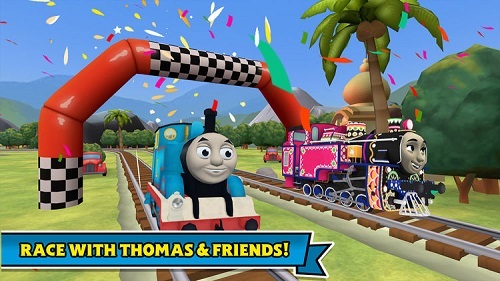 If you have little Thomas fans in your house, they’ll probably love this app. Parental supervision is recommended for the in-game purchases, though.